Plot Summary: TJ Forney is 13-years-old. Two months ago his mother was killed in an accident, so he and his broken dad, Paul, move in with his grandmother to pick up the pieces. “Hesher” is a loner. He hates the world and everyone in it. He has long greasy hair, a baby mustache, a Metallica t-shirt and homemade tattoos. He is malnourished and smokes a lot of cigarettes. He likes to get into fights. He likes fire and blowing things up. He lives in his van, until he meets TJ. 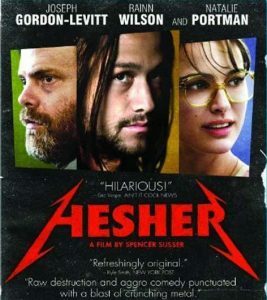 “Hesher” is the story of a family struggling to deal with a loss and the anarchist who helps them do it. – Director Spencer Susser is known for this short horror-romance-comedy.